I was lucky enough to land on Tom Cussen's doorstep the day before RTÉ were due to film the band Shaskeen for a forthcoming documentary, and so it was off to Pat Jordan's pub in Clarinbridge, and what a great night of music it was. Tom, by the way, makes instruments that are superb to look at and to hear. I'd met Sean Tyrell briefly many years ago when he was playing with Paddy Keenan in Melbourne. He's a fine singer and knows his way around a guitar. Eamonn Cotter (flute) was there, as was Charlie Harris (accordeon). I've spent many a day learning tunes from their recordings. 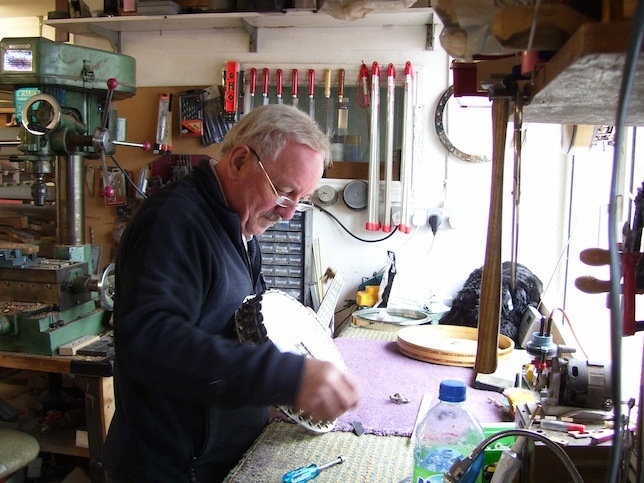 And of course Tom Cussen, who has had a big influence on my playing, on banjo. 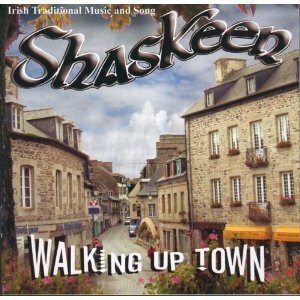 Shaskeen's new CD - "Walking up Town"
The one person I'd never met was Maureen Brown, a fiddler that Tom used to play with back in London in the 60's and 70's. Talk about hidden gems! I know nothing about fiddles but the tone she gets from her instrument is like nothing I've heard before. If you ever come across her at a festival she is a "must see". In a tour of many highlights she was definitely a standout. John Dooley was there. He sang on Shaskeen's recording in the early years, along with some locals whose names I've not recorded. Shaskeen's latest CD "Walking Up Town" represents a move back to more "listening" style music and away from their dance music CDs. More from Tony and Noel at Noel's sop in Nenagh. You can see the video on the Comhaltas site. Tony played banjo, with Noel McQuaid on accompaniment, at Noel's music shop in Nenagh. Recorded on May 17th, 2012. You can see the video on the Comhaltas site. Tony says they should have had make-up artists in attendance. Judge for yourself! Tony O'Rourke is currently in Ireland. Between 4th and 7th of May, he will be giving a concert and guitar workshop in Louisburgh, Co. Mayo, at Féile Chois Chuain. 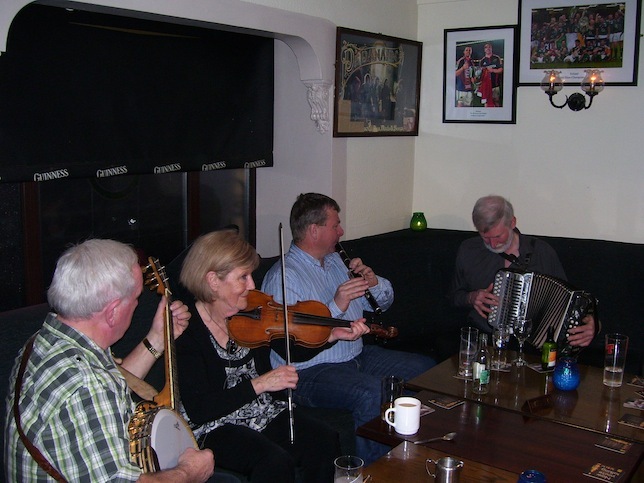 From 18th to 20th of May, he will be attending the Galway Fleadh in Clifden, in Connemara. He'll also try to get to the Offaly and Mayo Fleadhanna, but his itinerary is flexible. He also attended the Leitrim Fleadh - unfortunately Gerry was too disorganised to update the website in time for that one (27th to 29th of April). Keep an eye out for him (he'll also be selling his CDs, so you can get a signed copy). Dorian and Aeolian are both minor scales. Ionian is more commonly referred to as the Major Scale. This is the most widely used scale in Irish music. It's used in tunes such as “Miss McCloud’s Reel”, “Off to California”, and “The Blackthorn Stick”. The two most popular keys are G and D, with stringed instruments often using A. Sometimes C and F are used. Examples of mixolydian mode can be found in the tunes “My Love is in America”, “Langstrom’s Pony”, and “Rakish Paddy”. There is one note different between The Ionian and Mixolydian. The sixth note of the Ionian is flattened by a semitone. A contrasting example of these two modes in use is to be found in the Lennon/McCartney song “With a Little Help From My Friends”. The verse is in the Ionian mode but switches to a mixolydian mode for the chorus. Dorian mode is the most common form of minor scale in Irish music. Examples of tunes using this mode include “Star of Munster”, “Pigeon on the Gate”, “Green Groves of Erin”, and “Julia Delaney’s”. The majority of “minor” tunes use this mode. The Aeolian modes is known as the “pure minor”. It is often found in tunes that move to the related major key. “Paddy Lynn’s Delight” and “The Galtee Reel” are examples of this. You can download PDFs of the Ionian, Mixolydian, Dorian and Aeolian modes.